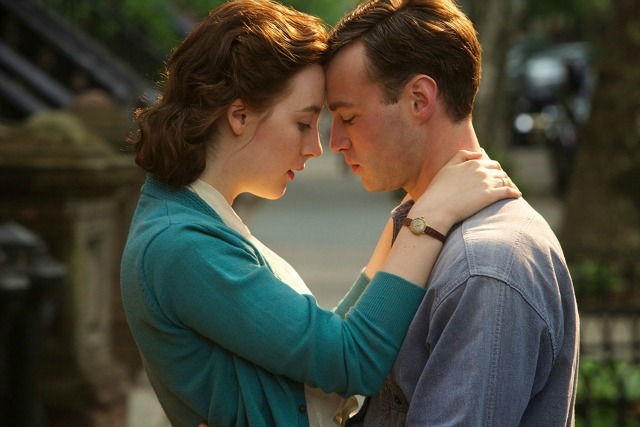 Romantic drama set in the 1950s which tells the story of young Irish immigrant Eilis Lacey (Saoirse Ronan), who moves from small town Ireland to Brooklyn, NY. The initial shackles of homesickness quickly diminish as a fresh romance sweeps Eilis into the intoxicating charm of love in the shape of Italian-American Tony (Emory Cohen). When a family tragedy brings Eilis back to Ireland, she finds herself absorbed into her old community and being courted by Jim (Domhnall Gleeson). As she repeatedly postpones her return to America, Eilis finds herself confronting a terrible dilemma, a heart-breaking choice between two men and two countries. Eilis Lacey: [voice over] I’m away to America. My sister Rose arranged it. Rose: [voice over] It’s hard for me to believe that you’re reading this thousands of miles across the sea. Eilis Lacey: [voice over] Father Flood sponsored me and he found me a job. Eilis Lacey: So what were you doing at an Irish dance? Tony: I really like Irish girls. Tony: Would you dance with me? The secret is to look as though you know what you’re doing. Eilis Lacey: I wish someone had told me that years ago. Eilis Lacey: [voice over] Dear Rose, I think of you and mother every single day. I have a boyfriend. He’s sweet, he’s funny. Tony has helped me to feel that I have a life here I didn’t have before I met him. Tony: I want to ask you something and you’re gonna say, “Oh, it’s too soon.” Will you come for dinner and meet my family? Eilis Lacey: I’d love to. Tony: You like Italian food? Tony: You want to go home I guess? Eilis Lacey: How would it be for you if I did go home? Eilis Lacey: Afraid that I wouldn’t come back? Tony: Yeah. Home is home. Eilis Lacey: I’d imagined a different life for myself. Jim Farrell: But your life here could be just as good. Better even. Eilis Lacey: [voice over] Tony I want you to know that… I don’t know what I want you to know. Eilis Lacey: [voice over] One day you’ll catch yourself thinking about something or someone who has no connection with the past, and you’ll realize that this is where your life is. Eilis: When you get to immigration, keep your eyes wide open. Look as if you know where you’re going. You have to think like an American. You’ll feel so homesick that you’ll want to die, and there’s nothing you can do about it apart from endure it. But you will, and it won’t kill you. And one day the sun will come out. You might not even notice straightaway, it’ll be that faint. And then you’ll catch yourself thinking about something or someone who has no connection with the past, someone who’s only yours, and you’ll realize, that this is where your life is.